Back in the 1990s, WinZip and WinRAR are two of the most popular file compression tools. Both of them are commercial shareware products. In 2000, 7-Zip was released as an open source product. Nowadays, with large size of hard drive and fast Internet connection, the file compression tools might not be relevant. However, they are still great for software distribution – especially when exe download is not available. It is still interesting to see how well this file compression tools performed with large movies, music and document files. Please note, for mp3 and AVI or QuickTime files, there might not be a reduction of file size as they are already in compressed state. In this test, we benchmarked 7-zip, WinZip, and WinRAR. The Windows XP search function is good for basic files lookup. At the time Windows XP was released, the average hard drive size was about 40GB. Nowadays, large hard drives mean searching for a file using the built-in Windows XP search function can be slow. Microsoft offers Windows Desktop Search (built-in for Windows Vista; add-on for Windows XP or older) but the indexing process utilizes significant resources. 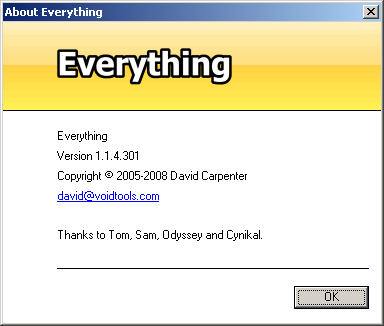 For lighter solution, Everything Search Engine (“Everything”) is a great alternative.